If you are a resident of Indianapolis, you have probably heard the warnings against swimming in the White River or eating fish from it. For generations, the river has been full of litter and pollution, earning its poor reputation. Every year, the City of Indianapolis takes steps to clean the banks and waters of the White River. But years of abuse, development and chemical runoff have contributed to major pollution and loss of wildlife. While it will take city organizations and non-profits years to clean up the river, improvements are being made for a cleaner waterway for Indy. The White River flows in two forks across most of Central and Southern Indiana, creating the largest watershed contained entirely within the state. It is the West fork of the river that begins in Randolph County, making its way through Muncie, Anderson, Noblesville and finally, Indianapolis. White River State Park is located on the banks of the White River, which meanders through downtown Indianapolis through the popular canal. While visitors enjoy strolling the walkways alongside the river or taking a short paddleboat ride on its rippling surface, one look into its murky waters indicates a high level of pollution. Believe it or not, the White River was once in worse condition than it is today. Through partnerships with various organizations, Friends of the White River, Indianapolis has been working to clean up the river for years. One way the city has done this is to host the annual White River Cleanup. The event has taken place for the past 23 years. Each year, hundreds of volunteers clean areas near Morris Street, Raymond Street and White River Parkway, removing debris such as tires and discarded furniture. Over the years, volunteers with this event have removed over 1.5 million tons of trash from the banks of the White River. 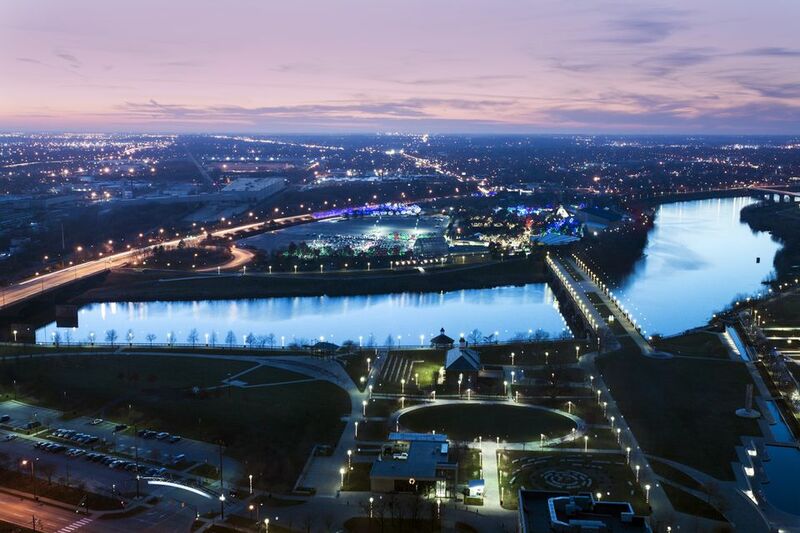 Over the past few decades, the area along the White River has seen huge increases in housing developments, shopping areas, and industrial parks. This rapid growth caused loss of wooded areas and trees which increased rainfall runoff. Industrial growth resulted in chemicals seeping into the river and water quality was compromised. Wildlife lost its natural habitat and even vegetation along the banks suffered. Though various organizations have been trying to clean up the river for generations, it took a catastrophe to really impact change. In 1999, a massive amount of fish was killed due to pollution from Anderson company, Guide Corp. The loss of such a large amount of fish sparked public outrage at the condition of the White River. The state cracked down, forcing the company into a $14.2 million settlement. Because of this incident, donations from private and public institutions started coming in with hopes of restoring the river to its former glory. While the river is no stranger to dumping, the development and upkeep of trails along the river’s edge have helped grow an appreciation for the river. The Monon Trail is probably the most popular; attracting joggers, walkers, and bikers from across Indy. The trail provides an escape into nature within city limits. The popularity of the Monon, as well as its constant traffic, have deterred people from dumping household debris and other trash along the banks of the White River. Government agencies, as well as non-profits such as Friends of the White River, are continuously working to improve conditions so that one day, Indy residents feel safe swimming in the river. Over the past few years, Indy Parks has been under financial strain and cleanup efforts rely heavily on volunteers. Those interested should contact Friends of the White River through their website. Looking for Amusement Parks and Coasters in Indiana?